BlytheLife.com » Affordable Blythes In Today’s Market? Affordable Blythes In Today’s Market? Often I’ll get emails from people asking where to find an “affordable” Blythe (or, even more often, where they can find a “cheap Kenner”). While I know that “affordable” is really a relative term, it does make me think about how expensive (and inexpensive) parts of the hobby can be. These questions will pop up on the Blythe Facebook groups as well, with helpful suggestions coming up about how one can purchase a “factory” Blythe for cheap on less than legitimate sources because factory dolls are counterfeit. But what about those who are looking for a real Blythe doll? What are the options? When I’m asked about where the affordable Blythes are, I find that a lot of people think that legitimate releases are $300 or more, which is hardly th case at all unless you’re looking at the rare and limited release dolls. I looked these up this past weekend – all on eBay, all USD pricing, all NRFB (never removed from box); costs of shipping excluded. There are still fantastic deals to be found if you’re willing to look for them! 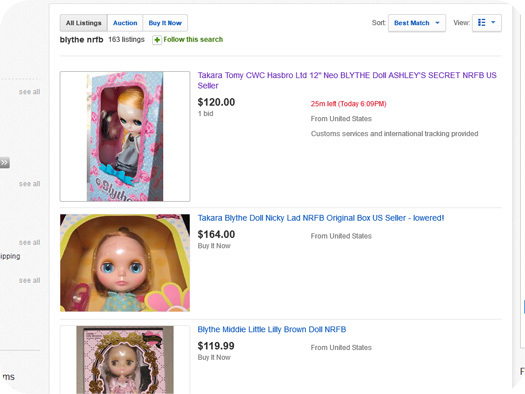 Pricing of Blythes can and do fluctuate, but that doesn’t mean that you can’t find affordable dolls if you’re patient. Pro tip for buying Blythes: join one of the buy/sell/trade groups on Facebook or a Blythe forum as you can often find some good deals on secondhand Blythes that someone is selling. While these are not NRFB, they may be slightly (or fully) customized, and you may find the pricing to be somewhat more palatable if you’re looking at a stock doll. Mandarake is a great source for inexpensive true release Blythe dolls. Shipping from them is super fast too! Absolutely right. There are NRFB dolls that go for under $200USD. CC Toys has a heap of ones under 200 (free shipping), like Monique Magnifique and Jane Lefroy, who are popular Blythes. As much as a lot of eBay is full of overpriced Blythes that stay online for ages, there are also great eBayers who sell genuine Blythes for good prices. You just have to make sure you find a legit seller. Where have you been looking? When I was on eBay, I spotted a couple of Simply Vanilla dolls that were listed (as Buy It Now, and also as auctions).